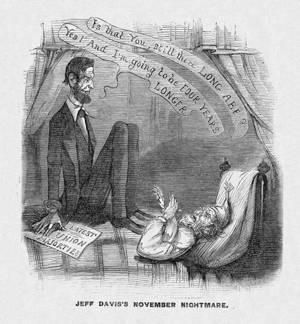 This cartoon in Frank Leslie’s Illustrated Newspaper depicts the reelection of Union President Abraham Lincoln as a nightmare for Confederate President Jefferson Davis. Like the Harper’s Weekly post-election cartoon, “Long Abraham Lincoln a Little Longer,” the featured cartoon from Leslie’s makes a pun about Lincoln’s height (6' 4") and how the electoral victory will extend his tenure in office. Of course, his assassination in April 1865 did not allow him to serve out the additional four years.